In 2017 Pete held a major retrospective exhibition at the National Library of Wales, featuring his work from across six decades. 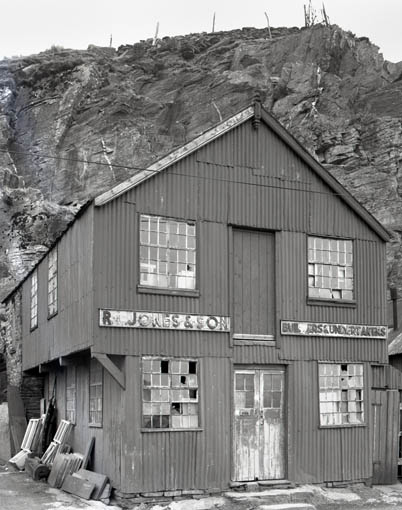 Great Little Tin Sheds of Wales was notably the first major body of work Pete produced after moving into the landscape from a city environment. We are grateful to the National Library of Wales for their support. 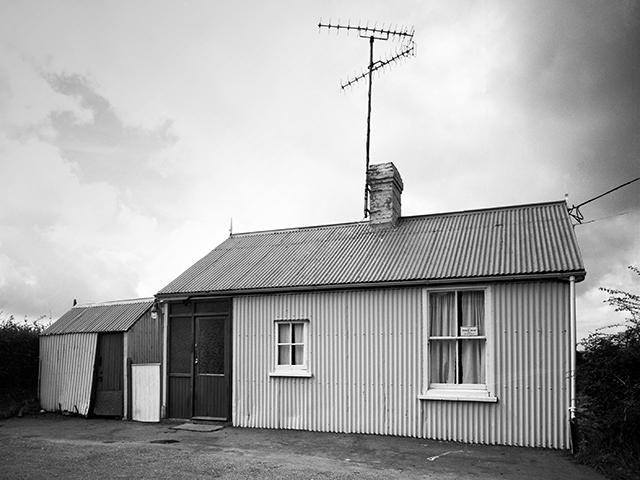 A fascination with the variety of these ubiquitous structures made from corrugated steel, and their place in the landscape of Wales provided the initial stimulus for the work. As the work progressed, it became clear that these structures also provided an insight into the social, cultural and industrial history of Wales. Seen by many as 'ugly' intrusions into the landscape, they are in effect only one, recent manifestation of the occupation and use of the landscape by the human population that has been evolving for thousands of years. The title of the body of work was a parody of those tourist attractions, 'The Great Little Trains of Wales'. These too were another manifestation of the industrialisation of the landscape, but have now been transformed by popular culture into icons of 'quaint' heritage interest. It may be interesting to note that many sections of the 'cultural' establishment in Wales, particularly those associated with the language, while applauding 'heritage' attractions such as the 'Great Little Trains', and turning a blind eye to the proliferation of ugly bungalows sprouting everywhere, hated this body of work. It was vilified by many, but achieved great popular success. 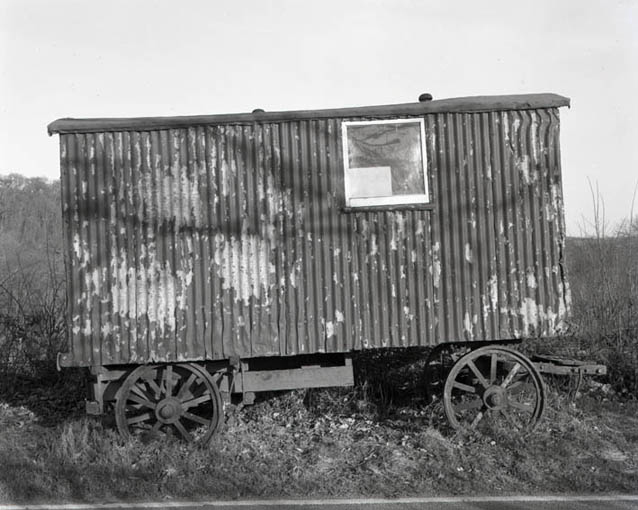 Great Little Tin Sheds of Wales toured the UK for over two years from 1984 to 1987, many prints were sold to both private collectors and public art collections, and with the income from this Pete was able to build his studio. Today still, many individuals will approach Pete to mention a tin shed they have seen recently, proving that the exhibition sparked an awareness of the landscape that transcended the pictorial. 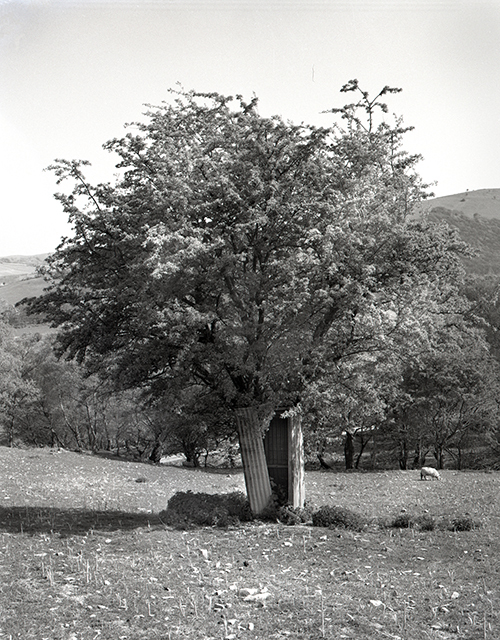 The photography of Welsh photographer Dr Pete Davis can be seen in many important national and international art collections. These include The Arts Council of Wales, Museo Genna Maria, Sardinia, and the Victoria and Albert Museum, London. Pete has been taking photographs since the age of eleven. After ten years as an advertising and fashion photographer, Pete moved to rural West Wales from where he has embarked on field trips around the British Isles, Europe and the USA undertaking his projects. For eighteen years Pete was senior lecturer in documentary photography at the University of Wales, Newport and for nine of those years the course leader. Currently he is a visiting lecturer at a number of universities and also engaged with his photography projects and research collaborations. He has received numerous research grants and awards and was the winner of the 2002 Wakelin Purchase Prize for Welsh artists. Work from the 'Wildwood' series has been acquired by the Glynn Vivian Art Gallery, Swansea and the National Library of Wales for their public art collections. He has been a visiting lecturer at the Karel De Grote-Hogeschool, Antwerp, Belgium; the North American Association for the Study of Welsh Culture and History in New York; the Royal Academy of Arts, the Hague, Netherlands; the University of Toronto and at the FotoMuseum, Antwerp. He has also been a guest lecturer at Aberystwyth and Cardiff Universities. Recent international exhibitions have included the Festival Interceltique in Lorient, Brittany, Gallery International, Baltimore, USA, at the Feick Arts Center, Poultney, Vermont, USA and at the Fotomuseum, Antwerp. Pete was also been an artist in residence and conducted masterclasses at the Polytechnic, Porto, Portugal, Green Mountain College, Vermont, USA,and as part of the Ulster Arts Festival, Belfast. He completed his Ph.D in Fine Art at Aberystwyth University in 2009.